Everyone knows the X-Wing. Some people maybe even know the Y-Wing. But A and B Wings? 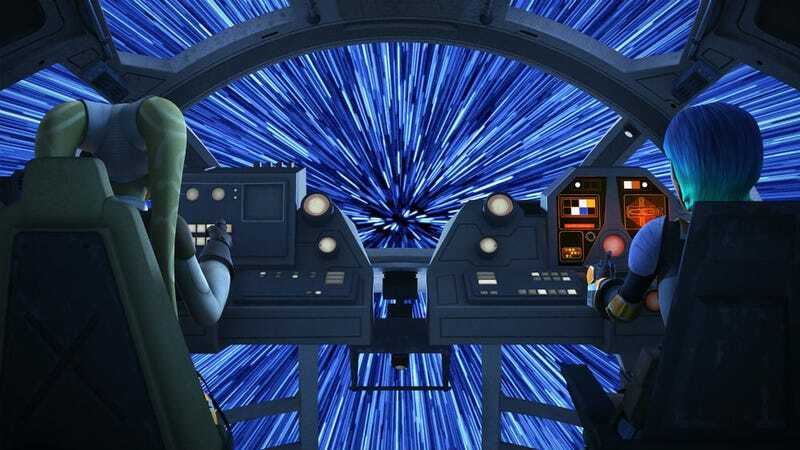 They’re definitely the lesser know Rebel Alliance ships and on the latest episode of Star Wars Rebels, we found out exactly how the B-Wing first came into play, with a lot of help from Hera Syndulla. The episode, Wings of the Master, set up a very simple goal. The Empire was starving a planet with a trade blockade and the Rebels were tasked with helping them. On a first attempt to break through the blockade, the Rebel ships—including the Ghost—got decimated and took heavy casualties. They didn’t think there was anyway they could punch through to help the planet. Not with their current hardware. Back at base, Captain Rex (this season’s deus ex machina, but we’ll let it slide) said he’d been in touch with a shipmaster named Quarrie who had designed a new ship. A “blockade buster” that they could use if they went to visit him. Kanan volunteered Hera, as she’s their best pilot. And despite her reservations she decided to go, hoping it would result in helping the citizens. Quarrie was on the planet Shantipole, which is basically a ship graveyard because its electrical field makes it all but impossible to land. Hera does though, seemingly passing her first test set by the short, stout Mon Calamari, who looks like a mix of R2-D2 and Admiral Ackbar. Quarrie then reveals his ship, which it sounds like he calls the “Bleed Wing.” We, however, recognize it as the classic B-Wing, just in red. He says it’s fast, maneuverable, and packs huge fire power. It’s exactly what the Rebels need. But he isn’t sure he wants to give it to them. It’s not until Hera explains a bit about her past – the first we’ve heard of it – that he softens. Turns out Hera was a young girl during the Clone Wars and “left her family so she could fly.” “When things are at their worst, I feel like I’m at my best,” she says. That’s enough for Quarrie. Here’s the clip. Hera takes the B-Wing out for a spin and, seriously, the result is a flying montage the likes of a Hollywood summer blockbuster. Rousing music, beautiful cinematography, clouds flying by, completely with laughs and action too. It was just an amazing scene, perfectly realized and built to show off how beautiful and under appreciated the B-Wing is in Star Wars history. Unfortunately, using the B-Wing’s primary weapon means it loses hyperspeed capabilities, so they won’t be able to make it to the next Rebel run at the planet blockade. Kanan and Ezra simply couldn’t wait anymore, and took the Ghost to try one more time to help the people in need. Quarrie, however upgraded the Phantom with hyperspeed, making a rescue possible. The Ghost is dead. Agent Kallus and his Imperial blockade are crushing the Rebels as they try to bust the blockade. Then, at the last moment, a ship of unknown design shows up. Piloted by Hera, the B-Wing gets into attack formation and blows up one of the Imperial cruisers, leaving a space for the Ghost to deliver the food. Misson complete. Back at base one more time, the commander tells Quarrie they will be mass production his ships and then promotes Hera to Captain. Okay, granted, the Inquisitor storyline we’re waiting for still hasn’t been dealt with. But Hera’s story was so strong, and the action so inspiring, it was a simply fantastic episode. Anytime Rebels can fill in a puzzle piece of Star Wars history, develop character and entertain along the way? Well, that’s Star Wars at its best.